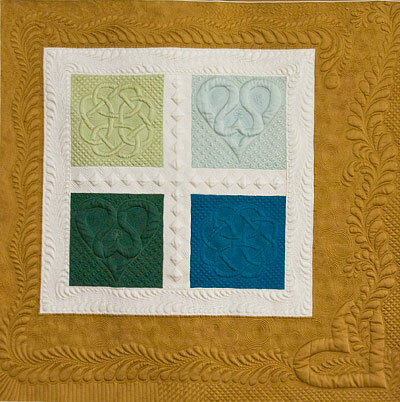 A new chapter in my quilting life began with floods of inspirations flowing from Diane Gaudynski's workshop at Asilomar in the spring of 2008. After returning home, I had bouts of feeling 'not quite centered' - you know, not quite myself; full of ideas but unsure where they would lead. This is a sample 'quilting sandwich' I made to test techniques for a larger quilt. As it transformed from a practice piece to a small wall hanging, it seemed completely appropriate that it was 'not quite centered'. This is the first time I tried Susan Cleveland's piping techniue. 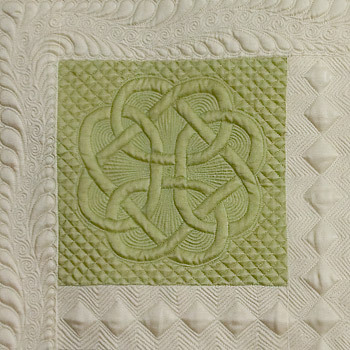 It is a great method, and I was pleased with the effect on this quilt. 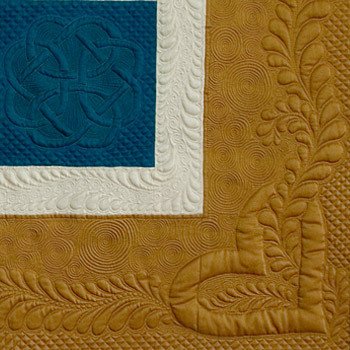 Detail of border quilting. Yes - the corner heart was trapunto'd.